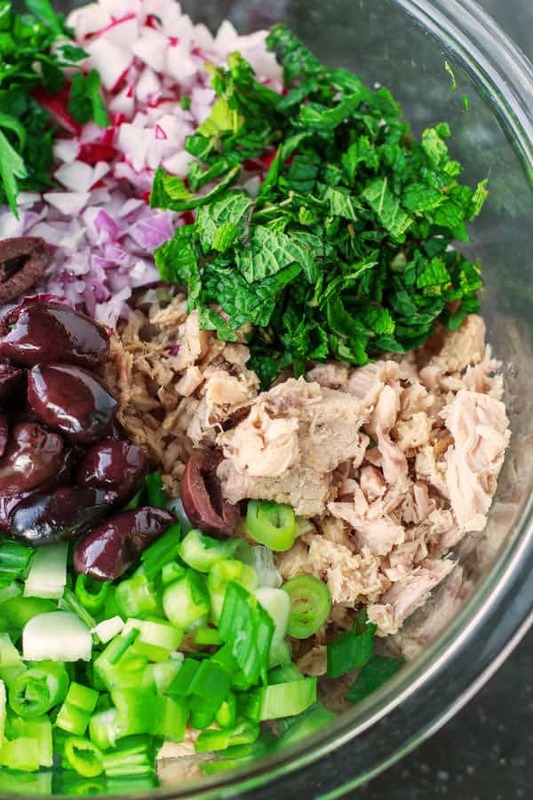 Healthy tuna salad recipe, the Mediterranean way. This mayo free tuna salad boasts lots of texture and flavor from crunchy chopped vegetables, fresh herbs, and a zesty Dijon vinaigrette. Among the cheer and celebrations brought on by the warmer weather, the month of May also marks international Mediterranean diet month. Did you know that? 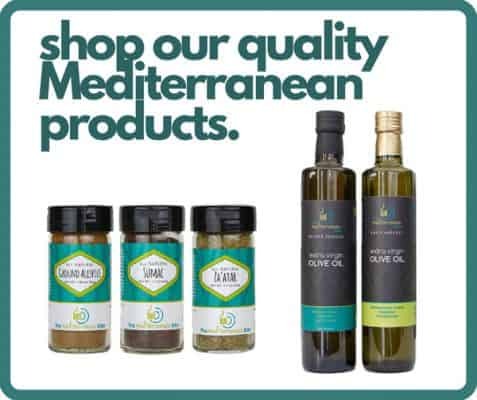 Some of us celebrate the Mediterranean diet every month of the year. And for good reason! You see, the Mediterranean diet is not a fad nor is it so much a “diet,” as in, “I am going on a diet.” It’s a lifestyle. It does begin with a balanced “poor man’s” diet that focuses more on grains; vegetables; dairy; proteins from nuts, seafood and lean meats, and far less on fatty meats. And yes, thank goodness, it allows a daily glass of wine! But it is also a lifestyle that emphasizes daily physical activity, and a balanced social calendar with frequent meals in the company of family and friends. 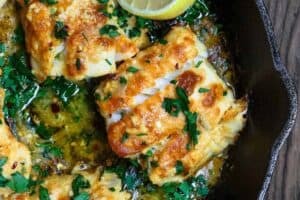 If I really had to choose my favorite parts of a Mediterranean lifestyle, I’d have to say: fish and large family gatherings. 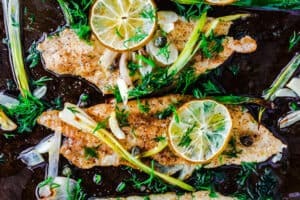 According to the Harvard School of Public Health, consuming something like 6 ounces of fish each week reduces the risk of heart disease by 36%! When I don’t really have time to make a big fish dinner, we do tuna salad night! This healthy tuna salad that is packed with crunchy vegetables, fresh herbs like parsley and mint, and a special zesty Dijon mustard vinaigrette. Since the tuna I have here is slightly flavored with a dash of salt and olive oil, there is really no need to go overboard with spices. Besides, the vinaigrette, fresh herbs, Kalamata olives, and a little peppery bite from chopped radish and onions, provide more than enough of the Mediterranean flavor I enjoy. When tuna is what’s for dinner, I usually add warm pita pockets and we just turn this tuna salad into loaded sandwiches. 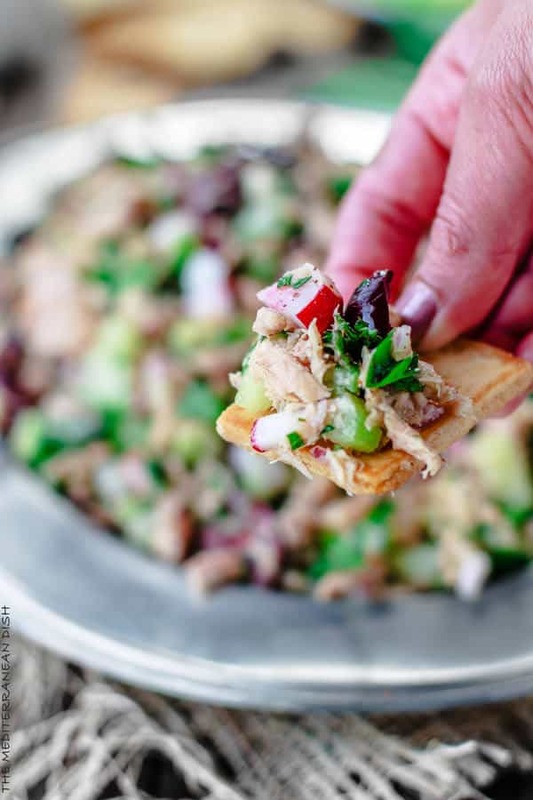 But this tuna salad recipe makes a good amount to serve a crowd as a starter or part of a Mezze hour. Just add tomato slices that can act as carriers for the tuna, or pita chips to go along. This salad is fantastic! The variety of flavors come together beautifully! We substituted a bit: shredded carrot instead of cucumbers, lemon instead of lime and harissa spice instead of sumac, but the results were an incredible. 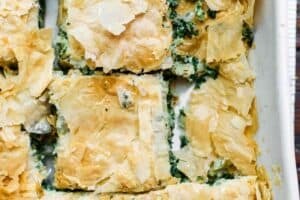 Thank you so much for this blog and your excellent recipes. Amy, thank you so much for sharing your variations! Sound amazing! Amazing! Definitely a make again… next time leaving off the dressing. 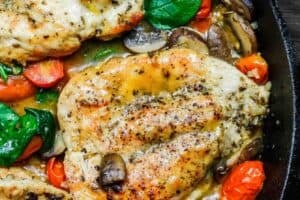 I loved the freshness of the parsley and mint with the fresh veggies! Deliciously! I may never eat regular old tuna salad again! Lol! So glad to hear it, Amy! Hi. Is the oil drained from the tuna can or not? It seems that it is not. YOu don’t have to drain the oil if using quality tuna! Fantastic! Light AND soooo tasty. Just put it on a bed of Bibb lettuce, sliced tomatoes and chickpeas. I love tuna and this is my new favorite. One o my favorites! Thanks for giving it a try! Thankfully the power stayed on, but I still enjoyed it today. The flavors melded overnight and it’s even better! The only thing I noticed is that it really soaked up the dressing and was a bit dry today, so I’ll have to make more as I still have leftover to finish. Thanks for sharing this! Deb, I’m so glad you tried this recipe. It’s my favorite tuna salad ever! The kind of tuna may have something to do too with how much it absorbs the dressing. So you can definitely afford to make more dressing the next day if needed 🙂 Thanks! It’s just me so is this good left over or does it need to be consumed the day it’s made? It looks wonderful! My family loves salads and yours look so. Appetizing . We will try them all. Thank you for sharing them with us. Awesome, Jeannette! We do a lot of salads here too. Hope you enjoy this tuna recipe! It looks amazing but I wish you had carbohydrate calculations per serving so that i can calculate for my insulin pump. Thank you, Becky! Unfortunately, I don’t have that capability at this point in time. I know there are several apps out there where you can input the ingredients and receive all the information you’re looking for. Sounds like a wonderful salad! This tuna salad looks absolutely fantastic! 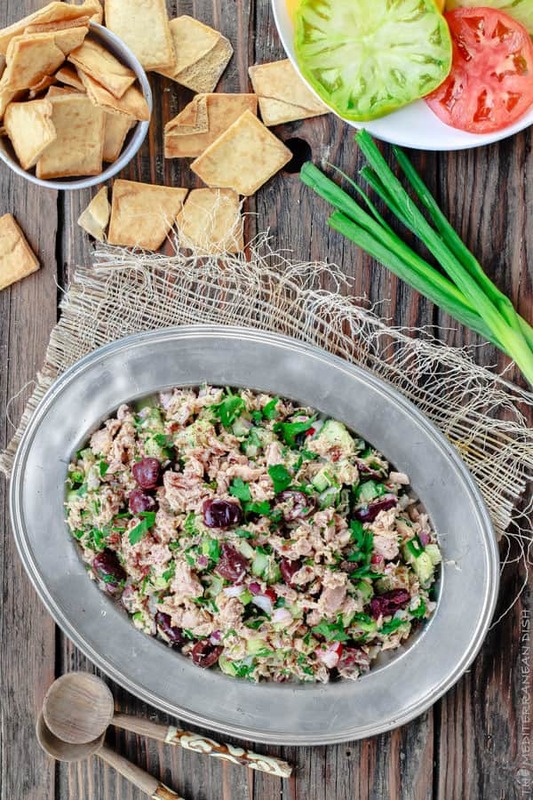 I love mediterranean meals and I am really looking forward to trying this new take on tuna salad. Valerie, this is my favorite ways to enjoy tuna. I would use a good quality tuna in olive oil. Hope you’ll stop by and let me know how you like it! Looks yum, would love to make it. Awesome, Celine! Let me know how it turns out! I made this today and it is delicious!!! 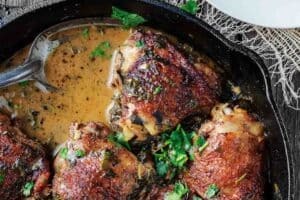 Wonderful simple flavorful recipe!! Christina, that is wonderful to hear! Thanks for taking the time to let me know. Oh how I love tuna from the Mediterranean! This is the brand that I always buy when I’m in an international food store! I MUST make this recipe very soon. I found your blog through another blog and now following so I can read more about your Mediterranean specialties since I’m Italian. Thank you for the kind giveaway. I will be happy to enter for a chance. Roz, thanks so much for taking the time to leave me your kind feedback! And welcome to The Mediterranean Dish. So glad you are here. I love tuna, whether fresh or from a can. Then only reason I don’t eat it more often is the mercury content. 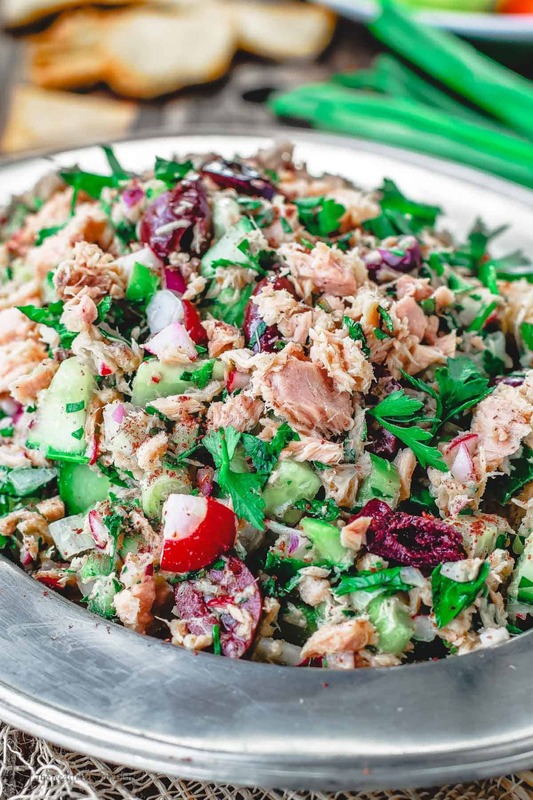 This tuna salad looks incredible! I can just want to eat the whole platter. Thao, thanks for stopping in! Yes, I know a lot of people have concerns about mercury. I do believe it is important to select high-quality tuna for taste and health reasons. Always read the labels; I look for wild-caught, all natural…Tuna is high on beneficial Omega 3 so I have decided that the benefits to the heart and brain counteract the potential hazards from the low levels of mercury. Still, consumption in moderation is advised. Great point, Thao! Thanks so much, April! ya, Genova premium tuna is different for sure. I could eat the stuff straight from the can, which is my test for good tuna! Thanks so much, Maureen! Ya, it’s getting cold where you are this time of the year!